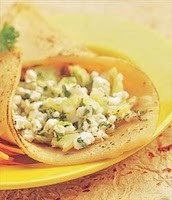 Paneer also known as Cottage Cheese is known for its versatility. Every body loves it. My kids are a sucker for paneer. They would devour any dish that I can concoct with them. This recipe was a given by a good friend whose daughter and my sons go to music class together. While waiting for the kids to come back from their classes, all the good old ladies waiting outside used to have great chit chat. It will be like big ladies only party. We all used to have a great time. I would call that as quality time well spent. As all the ladies had kids going to school within the age of 10, all of them had problems with lunch box. The trick is to prepare food that they can easily eat and to prevent them from bringing half the lunch back home. This is a great recipe was a sure hit among many of them. Mix the flours , oil and salt and make a smooth and pliable dough as you would for rotis by adding enough warm water. Knead the dough well and keep for ½ an hour. Knead again. Divide into 6 portions and roll out each portion into rotis with the help of a little flour. Cook lightly on both sides on a tava (griddle) using enough oil till they are well cooked. Heat the oil in a kadai or wok and add the green chillies and the grated cauliflower. Fry till the cauliflower is cooked. Now add the paneer, coriander and salt and cook for some time. Divide into 6 portions and keep aside. Place a hot Roti on a plate, place a portion of the stuffing on it. Roll as shown in the picture and serve hot. Won’t it look good in a lunch box. Apart from using cauliflowers I have also used other vegetables like juicy sweet grated carrots, beet roots, capsicums, succulent mushrooms etc. and you send this to the roti mela! Kamala: thank u for being the first one to comment. Sri: more follows. u can count on that. Wow, amazing click, thanks for dropping my site radhiak, your blog is amazing. Following you now, Thanks, drop by when u find time to my blog n leave your comments, it will be a great encouragement for beginner like me.